For commemorative US stamps, 1934 would seem to be a light year. There were four events for which commemorative stamps were issued, and three new philatelic souvenir sheets were issued for major stamp exhibitions. But, the end of 1934 saw one of the largest onslaughts of philatelically contrived stamp issues in the history of stamp collecting. The Scott Catalog refers to these issues as "special printings". Philatelists prefer to refer to them as "Farley's Follies". They will be briefly summarized at the end of this page. This imperforate souvenir sheet (Sc. #735) was issued on February 10, 1934 for the National Stamp Exhibition in New York City. 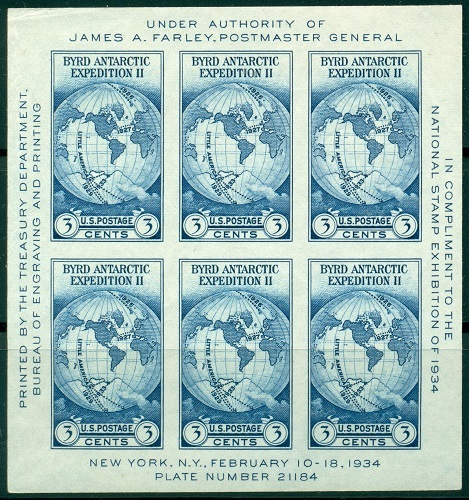 This souvenir sheet features six of the 3 Cent denomination Byrd Antarctic Expedition commemorative US stamps issued in 1933. This stamp (Sc. #736) was issued on March 23, 1934, and it commemorates the 300th Anniversary of the Founding of Maryland. The 3 Cent denomination US stamp pictures "The Ark" and "The Dove". On June 20, 1632, King Charles I of England granted to Cecil Calvert, Baron of Baltimore, the charter for the Province of Maryland. After a long and troublesome voyage, "The Ark" and "The Dove" finally arrived from England with the first settlers for the new Province of Maryland in March 1634. This stamp was issued on May 2, 1934 to commemorate Mother's Day. This issue was printed in two distinctly different formats, Flat Plate Press, perforated 11, and Rotary Press, perforated 11 x 10-1/2. The two varieties (Sc. #737-38) are worth about the same. The design for this 3 Cent denomination US stamp features the 1871 painting "Arrangement in Gray and Black #1" by James A. McNeill Whistler (1834-1903). The painting is best known by its popular name, "Whistler's Mother". The painting is located in the Musée d'Orsay in Paris, France. This stamp (Sc. #739) was issued July 7, 1934 for the 300th Anniversary of the Arrival of Jean Nicolet, a French Explorer, on the Shores of Green Bay, in what would eventually become the State of Wisconsin. The 3 Cent denomination commemorative US stamp features the scene of Nicolet's Landing at Green Bay. Jean Nicolet (1598-1642) is noted for exploring Green Bay off Lake Michigan. In 1634 he became the first European to explore what would become Wisconsin. He landed at Red Banks, near modern-day Green Bay, Wisconsin, in search of a passage to the Orient. He and other French explorers had learned from their native contacts that the people who lived along these shores were called Ho-Chunk, which the French translated as "People of the Sea". In their language, it meant "harvest the rice," as they used wild rice as a staple of their diet. Nicolet concluded that the people must be from or near the Pacific Ocean, and that they would provide a direct contact with China. ALAS! The ten commemorative US stamps shown above (Sc. 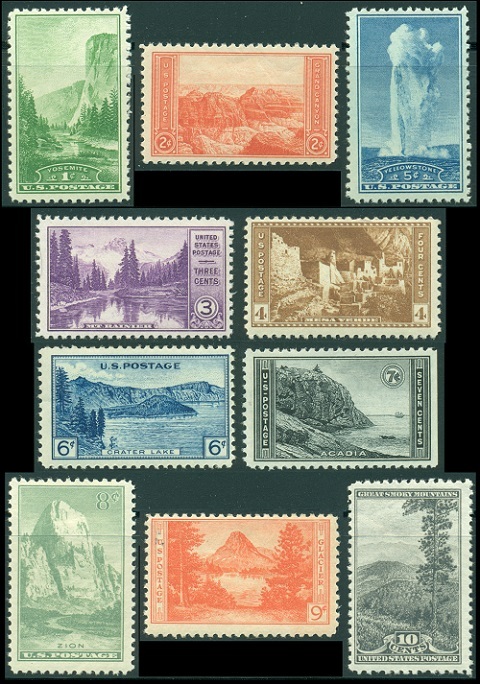 #740-49) were issued between July and September of 1934 for National Parks Year. They each showcase America's most beautiful national parks. 1 Cent - El Capitan in Yosemite National Park (California). 2 Cent - The Grand Canyon (Arizona). 3 Cent - Mirror Lake at Mount Rainier (Washington). 4 Cent - Cliff Palace at Mesa Verde Park (Colorado). 5 Cent - Old Faithful (Geyser) at Yellowstone Park (Wyoming). 6 Cent - Crater Lake (Oregon). 7 Cent - Great Head in Acadia Park (Maine). 8 Cent - Great White Throne in Zion National Park (Utah). 9 Cent - Mt. Rockwell and Medicine Lake in Glacier National Park (Montana). 10 Cent - Great Smoky Mountains National Park (North Carolina). This imperforate souvenir sheet (Sc. 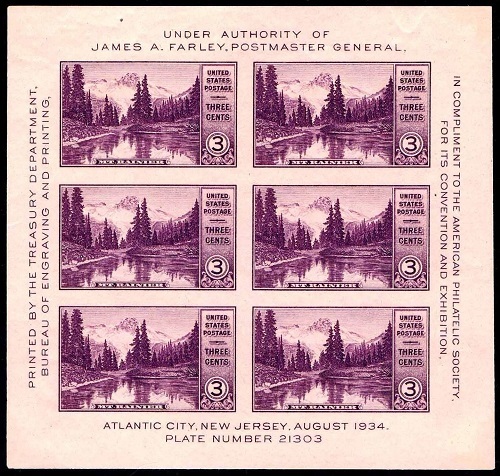 #750) was issued on August 28, 1934 for the American Philatelic Society Convention and Exhibition in Atlantic City, New Jersey. 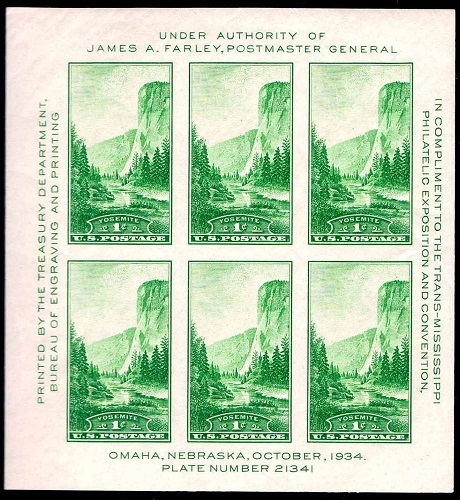 This souvenir sheet features six of the 3 Cent denomination National Parks Year commemorative US stamps issued during the Summer of 1934. This imperforate souvenir sheet (Sc. #751) was issued on October 10, 1934 for the Trans-Mississippi Philatelic Exposition and Convention in Omaha, Nebraska. This souvenir sheet features six of the 1 Cent denomination National Parks Year commemorative US stamps issued during the Summer of 1934. The Postmaster General of the United States from 1933 to 1940 was James A. Farley (1888-1976), and as such, he was a Cabinet Member during President Franklin Roosevelt's administration. President Franklin Roosevelt (1882-1945) was himself an avid stamp collector, and he did much to promote his hobby to the American public, during his four terms in office. When production would commence on a new postage stamp issue, Postmaster General Farley would quite often "purchase" the first couple sheets to come off the printing press. These would be uncut, imperforate, un-gummed, press sheets of 200 (for commemorative sized stamps) or 400 (for definitive sized stamps), and uncut press sheets of souvenir sheets, as well. Both Farley and President Roosevelt would sign in the margins. Postmaster General Farley usually gave one to President Roosevelt and kept another for his family. Farley also often presented these sheets to friends, as souvenirs or political favors. He did this twenty times during his tenure. When the practice became known to the public, it angered the Philatelic community, as well as political opponents. Feeling deprived of access to these unique and invaluable philatelic items, critics lobbied Congress, demanding justice. To address the public resentment, Farley ordered all twenty sheets to be reprinted in a special printing, without gum or perforations. The press sheets were to be offered for sale to every American that wanted to purchase them. The production of these special printings began on March 15, 1935. It should be said here that James A. Farley was an outstanding public official throughout his career. He served as Chairman of the New York Democratic Committee and later as Chairman of the Democratic National Committee, and he was largely responsible for the election of Franklin D. Roosevelt as President of the United States in 1932. James Farley also served as Chairman of the Board of the Coca-Cola Export Corporation, until his retirement in 1973. James Farley did nothing wrong in keeping examples of the stamp press sheets for himself and for President Roosevelt. He paid for the postage stamps that he took from the Bureau of Engraving and Printing, and as long as he and President Roosevelt kept the sheets, under the pretext that they would never be resold for a profit, this was a perfectly acceptable activity. The problem arose, when he began giving the sheets to friends, and when news of this reached the American public. These 20 Special Printings are listed in the Scott Catalog as #752 - #771. These special printings cover just about all the postage stamp issues of 1933 and 1934. With the exception of the Peace of 1783 and the Byrd Antarctic Expedition stamp issues, they are all imperforate and ungummed. Souvenir hunters and stamp collectors purchased millions of these stamps through the Philatelic Bureau in Washington, D.C. These stamps were not sold in post offices, and, being solely philatelic in nature, they were never intended to be used for the payment of postage. 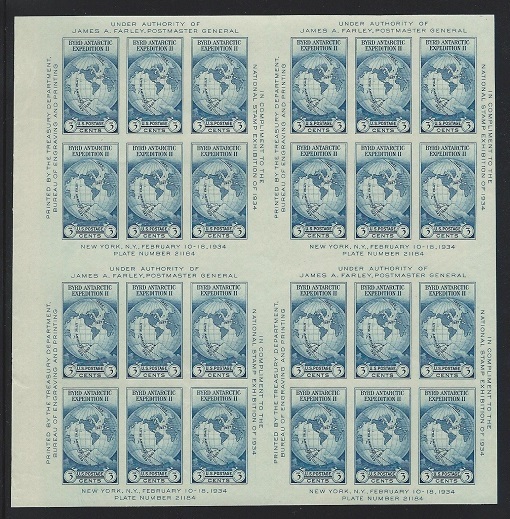 Most of the used examples are probably either favor-canceled or are from philatelic covers. With the volume of sales, they are, unfortunately, as plentiful today, as they were in 1935. And 100 years from now, they will probably still be as plentiful as they are today. If one desires, one can spend a lot of money on the collecting of these special printings. They can all be collected as partial press sheets, panes of 50 or 100, singles, blocks, gutter blocks and pairs, separator line blocks and pairs, souvenir sheet press sheets, etc. For the collector desiring to learn more about these philatelic special printings, please consult the U.S. listings in any Scott Catalog, or the complete listings in the Scott U.S. Specialized Catalog.